HubSpot is great at many things. One of those things is website/blog/email creating with the HubSpot COS. They make WYSIWYG editing extremely accurate and easy to do. However, with any tool, there are ways to improve your efficiency. 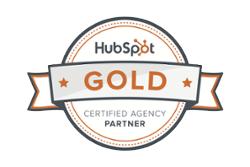 Here're 5 to get you using HubSpot COS like a well oiled machine. before your content/images hit the HubSpot COS, it will save you a lot of headaches and improve overall efficiency to paste that content WITHOUT formatting. In Google Chrome, this is called 'Pasting as Plain Text'. 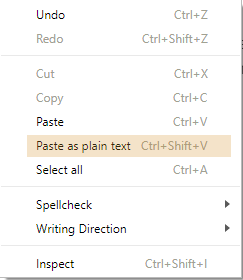 If you are a shortcut user (e.g., Ctrl-C & Ctrl-V), you simple add in the 'Shift' key when you paste. The first thing you'll notice is that any nice formatting (Bold, Headings, Colors), will be removed. YES, removed. This is important. When you paste something with formatting, behind the scenes the COS is taking the source HTML (where you copied it from) and including it in your page. This may sound harmless, but it causes problems with how your website is supposed to styled. often look just a little off. Off enough that you end up spending an extra 10-30 minutes making it looks just right. What's usually happening is you're competing with the pasted html code to get the content to look right. You drastically improve efficiency (and slow gray hair growth) by pasting without formatting, and doing your actual formatting in the COS. This one is simple, but really helpful. If you are working on a blog post, email, or website page in the HubSpot COS, take the opportunity to upload all of the images for that content at one time. It will save time in the long run. There are a couple options for doing this. When you need the other images, they will be ready for you to select. Click the 'Upload Files' button in the top-right of the screen. 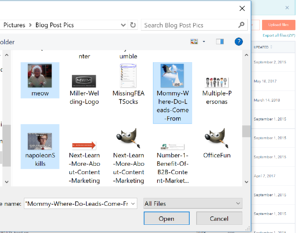 Click the 'Image' icon on the toolbar and select an image you uploaded. To be clear, this is not going to shave hours off your COS time. It is a nice way to be a bit more efficient. 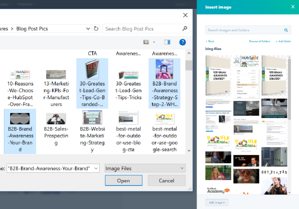 Did you know you can save a bunch of time navigating 3rd party stock photo sites, or creative commons pics by using the built-in Shutter Stock Library in HubSpot? While the library of photos isn't as extensive as sites like iStock, it has plenty to choose from in most cases. 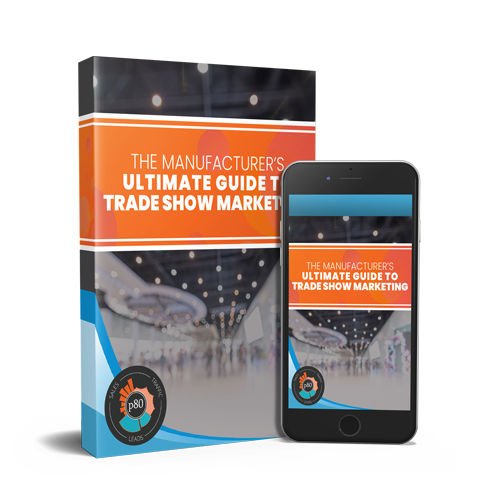 With any website, email marketing, and blog there are always heavily consistent elements. Things like the header, footer, side bars, etc... just don't change often. 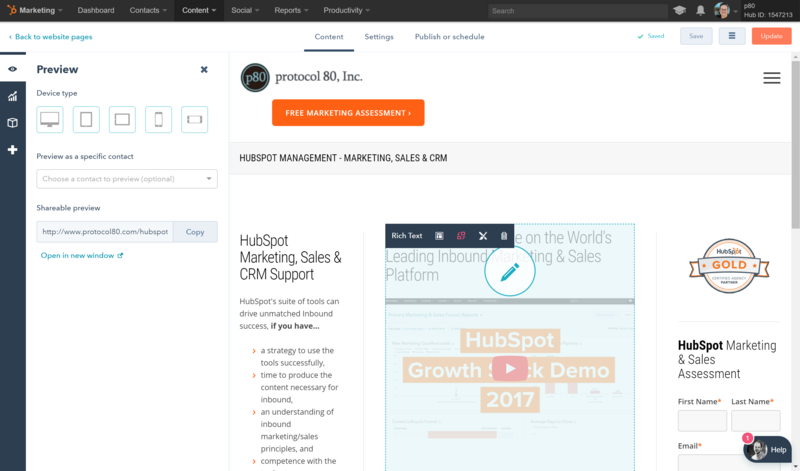 The use of HubSpot Templates (paid or free) can save a ton of time when building out content in the HubSpot COS. HubSpot also has a nice library of templates you can purchase if the need arises. If you can't find one that trips your trigger, you can always get one that's close and have a developer customize it for you. Side Bar or Non Side Bar. Having these options at your disposal makes using the HubSpot COS much faster. Modules work much the same. If you purchase a set of templates with some 'advanced' features likes blocks of images across the page, they often come as modules. Modules take layouts/functions of your pages that you want to be able to re-use consistently and abstracts the design/code to make it easy to use. This means you don't need to know how to style a block of 4 images that show side by side across a page, thus saving you a ton of time! If you're using the HubSpot COS on a regular basis, you're doing yourself a disservice if you haven't taken the HubSpot Software and HubSpot Design Certifications. These certifications are FREE and will give you the guidance you need to be a HubSpot COS rock star! Have a Question About the HubSpot COS? We'd be happy to help! Comment below, or click the button below to schedule a time to chat!